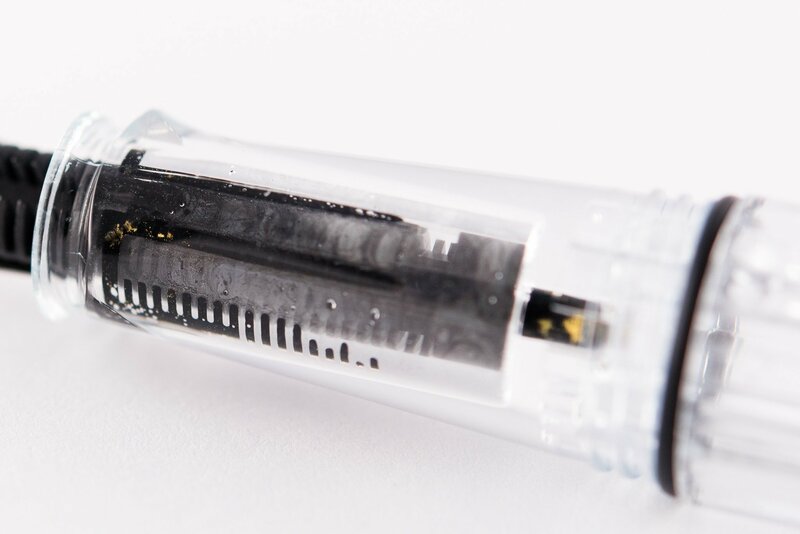 If you’ve ever wondered if using a shimmering ink will clog your fountain pen, you’re not alone. 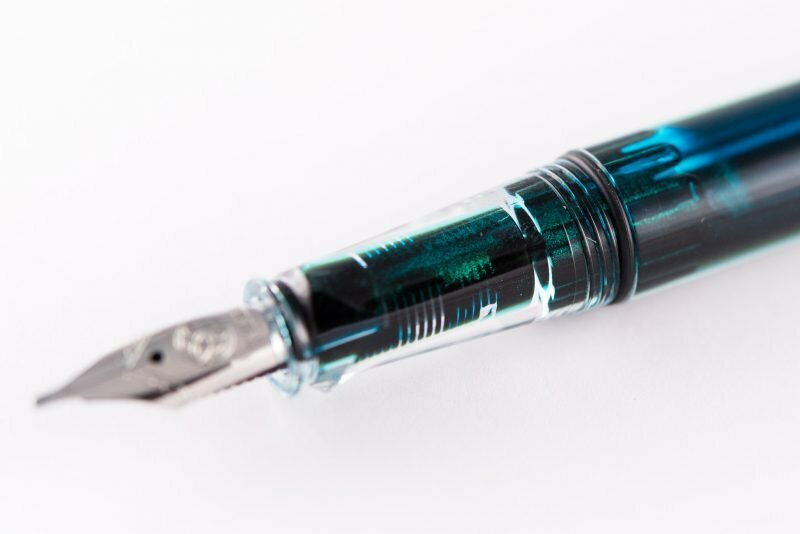 While many people love the look of shimmering inks and enjoy the extra dimension that it adds to their writing, there is always the fear that the particles of shimmer will clog the feed of their fountain pen. Today I want to tell you about my experience with shimmering inks and show you a few photos to let you see exactly what’s going on inside of your pen. Please note: This post is based purely on my own personal experience. I am sure that other people have had very different experiences while using shimmer ink. With that being said, never use any ink in your fountain pen that you are not comfortable with. First off, you should know what a shimmering ink is. Basically, shimmer is tiny particles of shiny material that is added to ink… or, in other words, glitter. Of course, it’s not actually glitter, as those particles are too large, but that’s the easiest way to think of it. Keep in mind, shimmer is different from sheen. Sheen is a chemical property of ink while shimmer is something that is added to ink. You can see how fears of clogging are valid. Adding anything solid to a fountain pen ink sounds like a pretty bad idea, yet it is more prevalent than ever. Multiple popular ink manufactures now have shimmer options in their ink lineup. 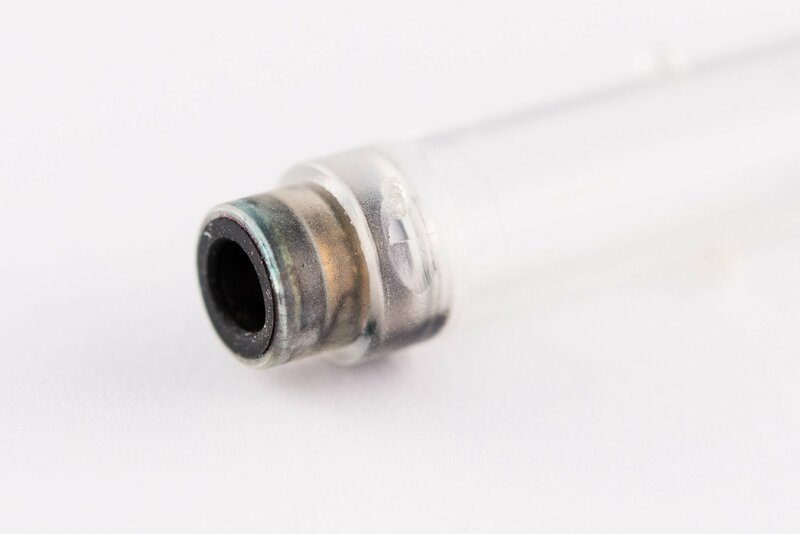 Is this something you should fear or are people just being too careful with their fountain pens? I think one of the best ways to discuss shimmer is by showing images. First off, let’s take a look at what writing with shimmer ink looks like. The light is hitting this writing just right and the shimmer really stands out. This is a different view of the same writing sample. You can see the silver sparkles, which are shimmer. 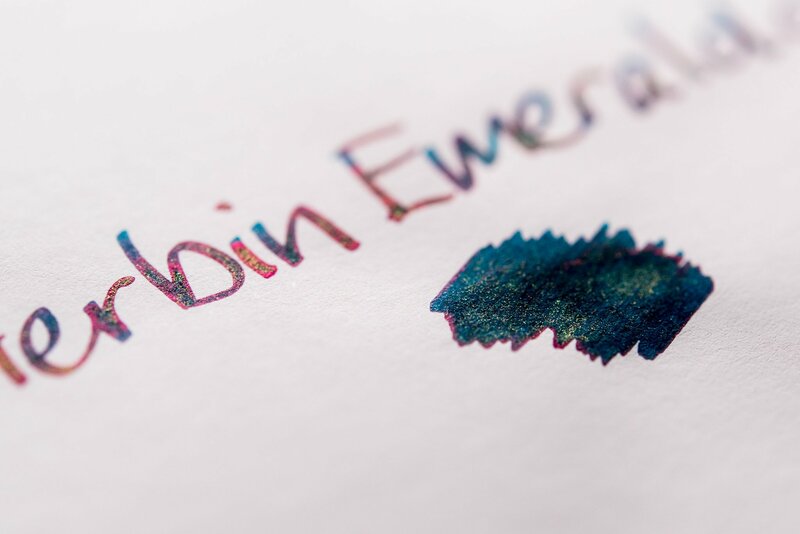 This is a different shimmer ink, J. Herbin Emerald of Chivor. The ink is green with red sheen. The shimmer is gold. 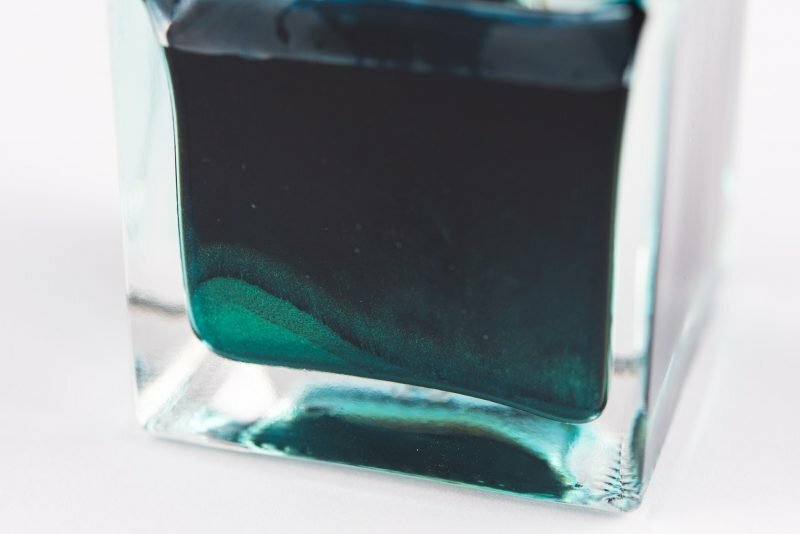 Next, let’s take a look at what shimmer looks like in an ink bottle. You’ll see that it all settles to the bottom of the bottle, which means you need to shake up shimmer ink before filling a pen. 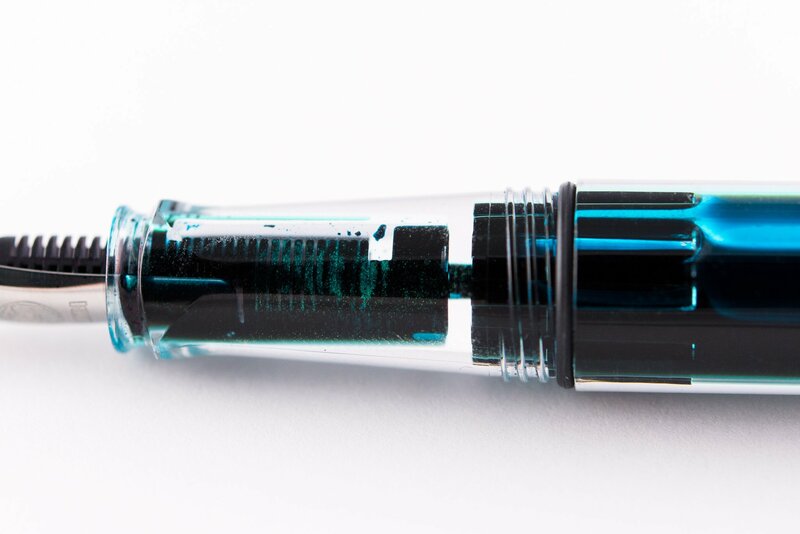 Here’s a side view of a bottle of Emerald of Chivor. You can see the shimmer at the bottom as a light sediment. 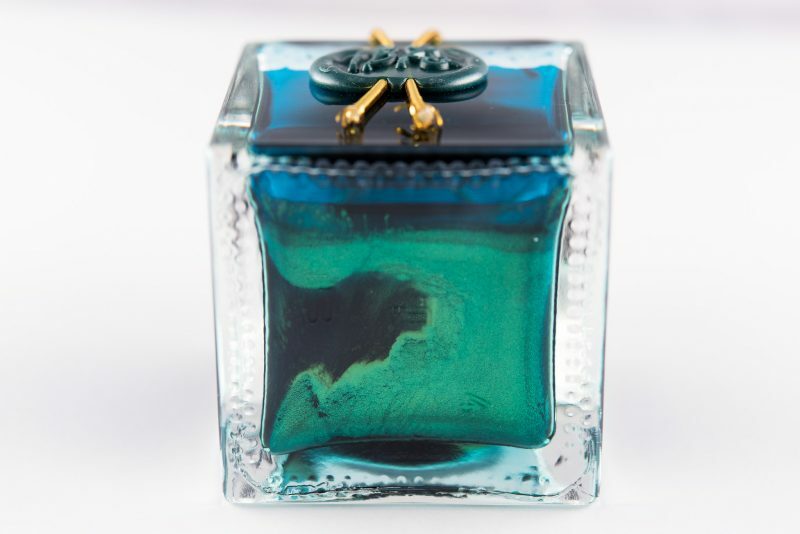 The bottom of the bottle shows how much shimmer has settled out of the ink. 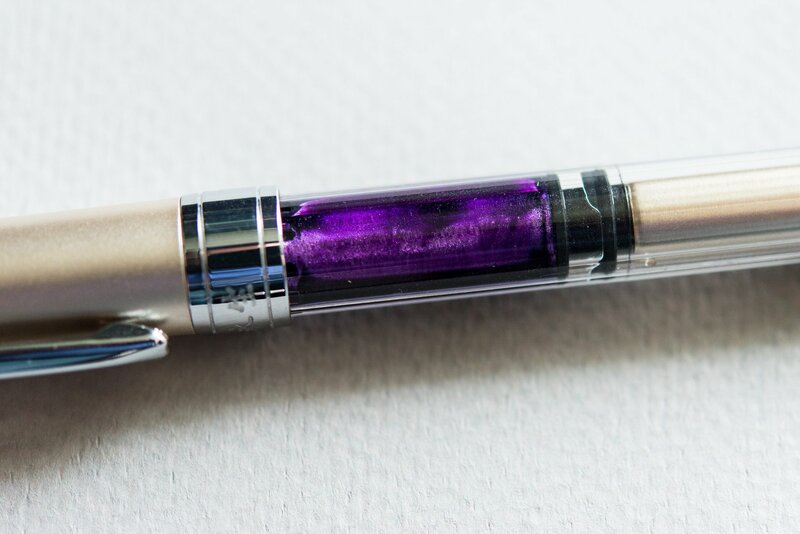 In this image you can see how much shimmer is in the feed of this pen. Here is another view of the feed with lots of shimmer in it. 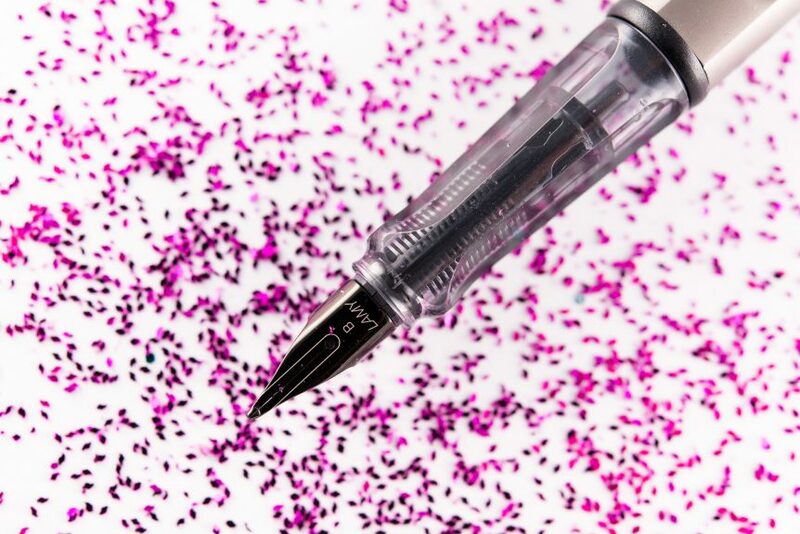 One side effect of using shimmer ink in a pen is that particles of shimmer may remain in your pen and show up in your writing after cleaning, even if your pen is not filled with shimmer ink. This freshly cleaned pen still has bits of shimmer (gold flecks) that did not come out. This Lamy converter has probably been used and cleaned 5 times since I used shimmer ink in it, but it still has traces of shimmer stuck in it. After cleaning the TWSBI you saw earlier in this post, I filled it with Pelikan Blue-Black, which does not have any shimmer in it. You can see a few particles of shimmer in this writing sample. So does shimmer ink clog fountain pens? It depends on many different factors. The two main factors are likely going to be the size of nib your pen has and what your pen use and pen hygiene is like. Personally, I’ve never experienced any clogging issues with shimmer inks. This may be due to the fact that I typically use Medium and Broad nibs, which have higher ink flow and larger channels for the shimmer particles to move through. I also try to use any pen that I fill with shimmer ink on a regular basis (at least once a day) so that the ink doesn’t dry up in the nib or feed. 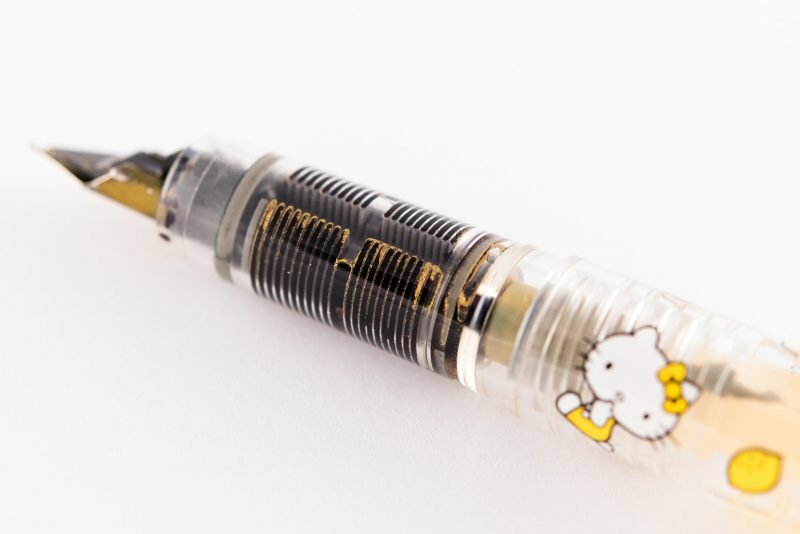 On the other hand, my wife has a Platinum Preppy with an 03 Fine nib that she absolutely loves (it’s Hello Kitty themed). I filled it with some shimmer ink (J. Herbin 1670 Stormy Grey) and the nib did clog once or twice, which had never happened with other inks. A quick wipe with a damp paper towel immediately fixed the problem, so I’m not sure if the culprit was dry ink or shimmer or just a cheap pen. Still, it has been essentially trouble-free. Would it have happened if the nib was larger? What about a Fine nib in a more expensive pen? I’m not sure, but this example stood out to me since I never use Fine nibs and she experienced a problem with it. The feed in my wife’s Platinum Preppy is full of shimmer particles. I wanted to try another pen with an even finer nib to see what would happen. I have a Wing Sung 3008 with an EF nib, so I filled it with J. Herbin 1798 Amethyste de l’Oural. After using it for almost two weeks, I have yet to encounter any issues with it. It flows just fine and is a pleasure to write with. In my opinion, that’s saying a lot for a $4 Chinese pen filled with shimmer ink. This Wing Sung 3008 is filled with shimmery purple ink! Another dimension is which brand of ink you use. The shimmer inks that I mainly use are J. Herbin’s 1670 and 1798 line, which have never given me trouble. Would Diamine, PenBBS or Robert Oster inks perform differently? It’s possible. At the end of the day, I don’t think that fountain pen ink manufacturers would knowingly put out inks that are dangerous to use in fountain pens. That doesn’t mean that you won’t experience issues with shimmer ink. You may very well experience clogging or other issues, but you might also have an enjoyable and trouble-free writing experience. If you do want to use shimmer inks, my suggestion is to use them in a pen that can be disassembled and cleaned if necessary. I’d also suggest that, unless you eventually want all of your writing to have a bit of shimmer, you use them in only a few of your pens. John, I’ve ordered YUnnuopromi 25ml Non-Carbon Glitter Fountain Pen Ink, It was a bargain on Amazon. It hasn’t arrived yet. After reading this article I think I’ll try it in a WS 3008. I have a dozen of them. Thanks for the warning. From what I can tell, the WS 3008 should handle shimmer ink very well, but I haven’t tried that specific brand. At least they’ll be a good test and if you don’t have any issues in those pens you can move to another pen if you want. Enjoy! 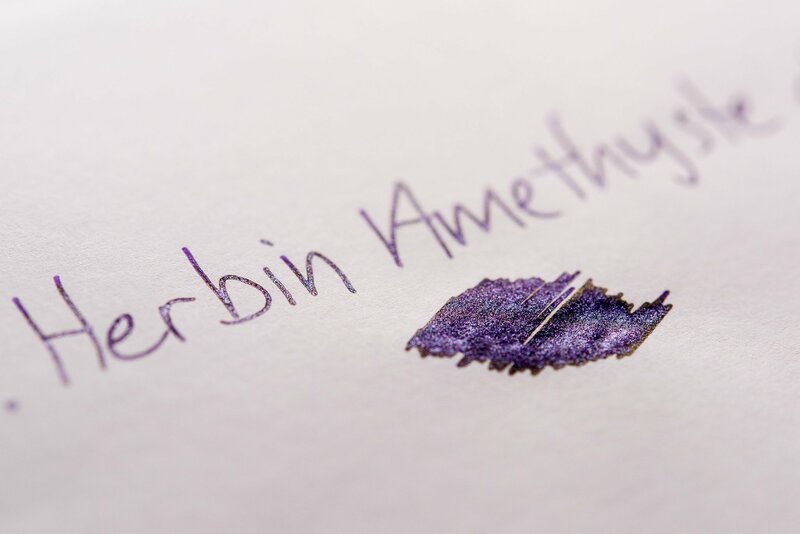 Diamine shimmer inks have generally behaved well for me (I did try them in a Platinum Preppy eyedropper conversion and it wouldn’t write at all) but I would advise staying far, far away from De Atramentis shimmer inks. The shimmer particles seem to be slightly larger than those in Diamine, and they clogged my TWSBI Eco broad nib constantly. That’s good to know. I will steer clear of using the De Atramentis shimmer inks unless it’s for experimental purposes.